There are approximately 350 different types of pasta around the world — and about four times that many names for them! For example, due to its shape, farfalle pasta is often called “butterfly” or “bowtie” pasta. 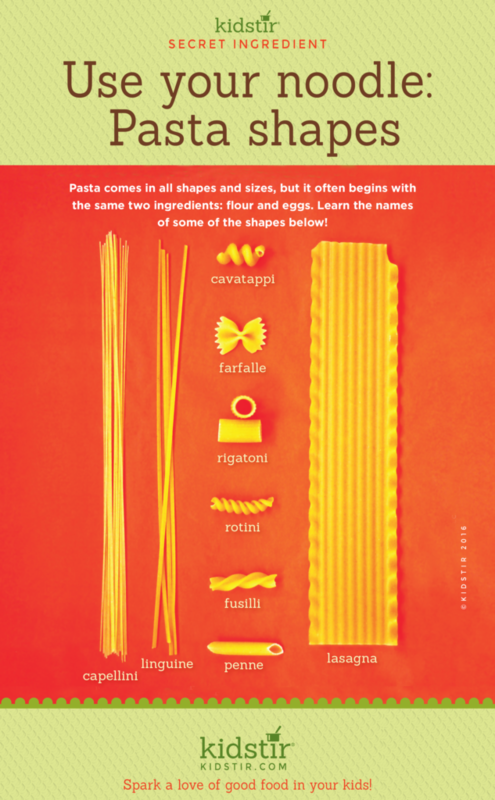 There’s even a cookbook called “Geometry of Pasta” which was the subject of an NPR radio interview. The book is full of recipes by chef Jacob Kenedy and hundreds of black and white drawings of pasta shapes by Caz Hildebrand. Want to make pasta for dinner? Kids can help you whip up dinner tonight with an easy Italian recipe. Top your favorite pasta shape with a simple caprese sauce of fresh mozzarella, tomatoes, and basil. Dinner’s ready! Very simple ingredients include fresh mozzarella, fresh basil, olive oil, tomatoes, garlic, salt, 1-pound box of your favorite pasta shape noodles and freshly grated parmesan cheese. Done! This takes just 15 minutes of hands-on time and 25 minutes start to eat time. 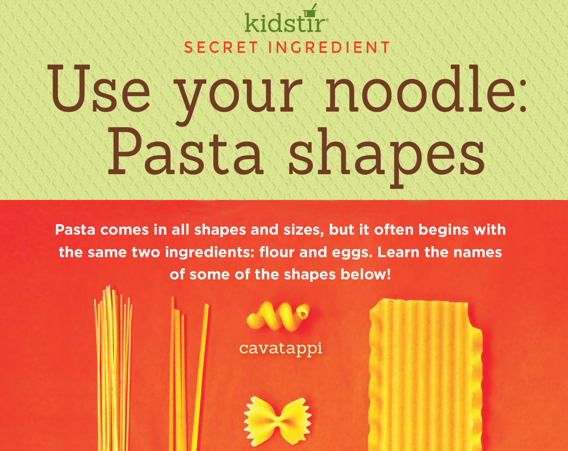 We’d love to offer this Pasta Noodle Shapes Infographic for you to share on your blog. Just select and copy the code snippet below and paste into your next blog post.